The Leeds Public Library began about 1923 in two rooms above what was then Whitehead’s Grocery on Ninth Street. In the early 1930s the library moved to Leeds High School with Winnie Carlisle as Librarian. The library moved to a room in City Hall in 1966. Louise Lahan became Librarian when “Miss Winnie” retired in October 1967, after 37 years of service. The first legally constituted Board of Trustees was appointed in September 1967. Jane Culbreth, a champion of city improvement, was on the Board of Trustees for the Library Development Committee formed in September 1967. Her dream was for a larger library for the city. The existing library bears her name as a tribute for her library work and her many other civic accomplishments. As public interest and financial support grew, the city leased the building at the present location on Parkway Drive from Ray Little in 1981. The Library opened at its present location in April 1981. Martha Rogers became Director in October 1971 and held that position until retirement in 1992. Donna Cole was hired as Director in July 1992 and remained Director until her untimely death on August 27, 1997. Doris Jarvis was appointed acting Director at that time. She was then hired as Director in February 1998 where she remained until her retirement on June 1, 2008. Mondretta Williams was hired as Director June 1, 2008 until her retirement on February 1, 2017. Melanie Carden was hired January 03, 2017 and is the current Director. On April 19, 1998, the library celebrated seventy-five years of library service to Leeds. The Leeds City Council held a special meeting at that time to officially rename the library the Leeds Jane Culbreth Library. The Leeds Jane Culbreth Library has a full calendar of events each month to enhance your reading and learning experience. Please visit the library often to take advantage of the many benefits and resources. 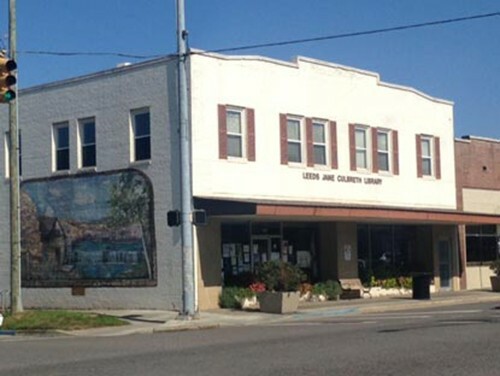 The Leeds Jane Culbreth Library is currently located at 8104 Parkway Drive in historic downtown Leeds. For more information, please call 205.699.5962.